Film review – Hunt for the Wilderpeople (Taika Waititi, 2016) | Cinema, etc. SPOILER ALERT – There’s a spoiler pretty much immediately in the first paragraph of this review. Sorry, it just turned out that way. Come back when you’ve seen the film and rejoice in its excellence with me. General and spoile-free review: it’s excellent and well worth watching. There is a moment, about twenty minutes into Hunt for the Wilderpeople, where the laughs start rolling in and the set up falls into place, proving that very good things come to those who wait. That this happens in the middle of the funeral of one of the lead characters, who is unexpectedly killed-off in the middle of the opening act, proves the point that comedy doesn’t have to be routine to be absolutely hilarious. Indeed, looking at the two lead actors, there is nothing to suspect they would work on a comedy duo level. Sam Neill has been doing fantastic work for years, delivering memorably serious performances in the likes of The Hunt for Red October, Dead Calm, The Piano and Jurassic Park. 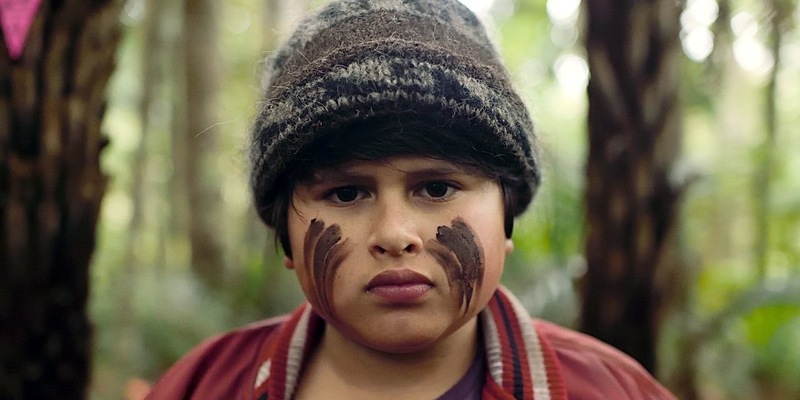 His partner in crime in Hunt for the Wilderpeople, Julian Dennison, is pretty much a newcomer to the industry, having starred in 2015’s Paper Planes and not much else (at least not much that has troubled the international market). It’s strange then that they have formed a bizarre chemistry around which this film’s many successes hang, taking turns to be the straight man when the time is right. It’s a successful combination and one that takes what could have been a simple live-action remake of Pixar’s Up and turns it into an enjoyable romp through the New Zealand countryside. Dennison is, ultimately, the real find of the film. As the rebellious youth that nobody wants, he is privy to some of the best lines in the film. His delivery is natural and faultless. Taika Waititi may be in the process of directing the upcoming next instalment of the Thor film series (set for release in late 2017), but he is staying rooted to what he knows best for as long as possible. One can only hope that Marvel allow him to finish his journey with the film rather than lose faith at the eleventh hour as they did with the last quirky comedy director they went with: Edgar Wright. On this evidence, they would be wise to not make the same mistake twice. Hunt for the WIlderpeople is available now on DVD.